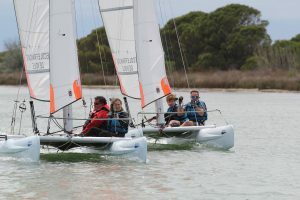 … Learn from the dynamics of the group the basics of sailing or rolling through a quality teaching taught by our instructors graduates. We can accommodate you punctually on a session of one hour or more. 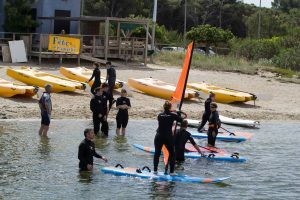 Playful Learning–Team spirit-why not start the competition by participating in the classification of EntreprisesGliss in a sailing or windsurfing tank? Build your teams and allow them to access the training necessary to participate at the departmental ranking, a real group work for a common project. 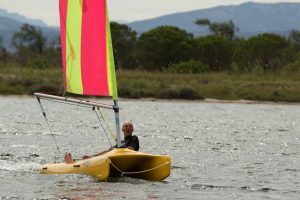 The Funboat sails in a playful way without risks and with great pleasure for the novice. Few constraints, one is quickly in action and one can easily measure to each other, by crew in all conviviality. 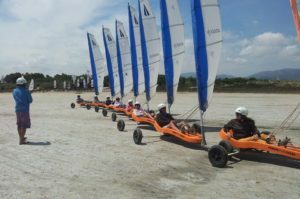 The catamaran for an public insider, to go in raid to 2 or 3 per boat, under the supervision and advice of a instructor, to sail on the lagoon safely. 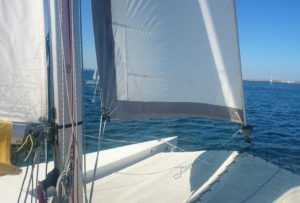 The yachting sand, unique on the Mediterranean basin, to enjoy and discover new sensations with the possibility of access to the challenge EntreprisesGliss for the employees who have validated their level 4 and having a team Departmental. 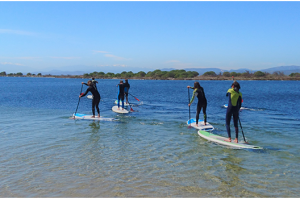 Windsurfing, a cycle of at least 3 sessions in order to enjoy yourself and discover a new sport with the possibility of accessing the EntreprisesGliss challenge for the employees being autonomous and having a departmental team. to physically move to discover the lagoon in a playful form or challenger with the others, all alone on his boat or 4 on the pirogues. The Aquali33, the possibility to embark on a catamaran of 10 meters to discover the sailing on the lagoon of Salses-Leucate or at sea, on a half day in the sun and the sweetness of the Mediterranean. 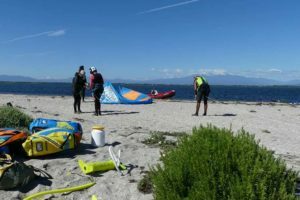 Kitesurfing for beginners and insiders, our team will accompany you to discover this discipline safely. Our partner is available to you the new equipment of the year,for your pleasure.